Dedicated teachers throughout Haiti will tell you that one of their greatest challenges is students who come to school hungry. Younger children begin crying by 10 AM, asking for bread or other food. The eyes of older students glaze over about Noon, a blood sugar levels dwindle. Even the best teacher is no match for Grangou (hunger in Haitian Creole). Fortunately, the student at the Parish Schools in Sassier get a healthy snack at the beginning of the school day and a hot lunch four times a week. Food is supplied by the World Food Programme (part of the UN) and salaries, fuel, spices and other necessities are made possible by your generosity. Even those costs are nearly $700 per month. Our students are very fortunate that the Sassier schools have the physical and human infrastructure to qualify for the WFP food program—secure storage with steel doors, dedicated interior room for cooking, as well as inventory control and recordkeeping. 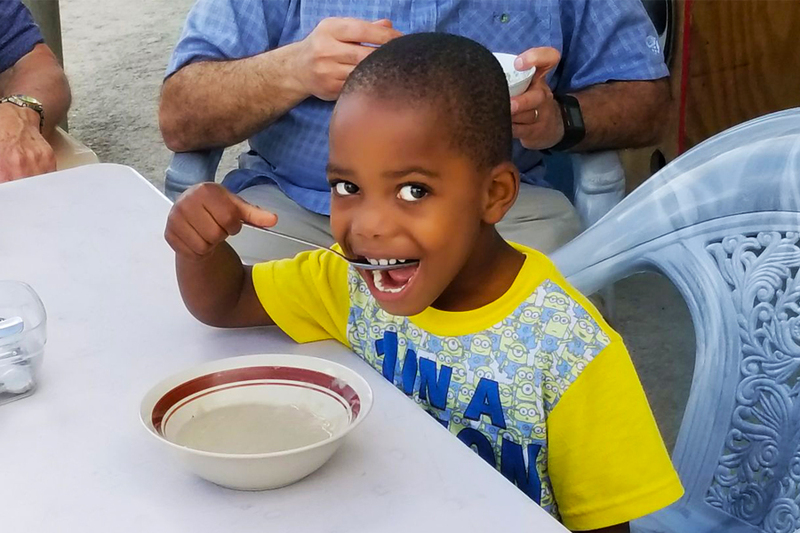 Unfortunately, most rural schools in the Grand Anse province (where Sassier is located) do not meet the WFP requirements, or cannot afford the staff, fuel and other necessities for the lunch program. The students in Sassier, as well as their teachers and parents, are very blessed. Even so, it is unfortunate that almost all the food supplied by WFP is imported, even though there are ample supplies of healthy food supplies that could be purchased locally. You’ll remember that our Agriculture Project has been working with 230 farmers over the last 18 month to rebuild their farming businesses after the destruction of Hurricane Matthew. Recently we expanded the program to agricultural processing, creating value-added products from the farmers’ production. 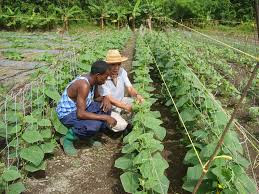 Our goal is to serve markets in Haiti and, eventually, export markets. 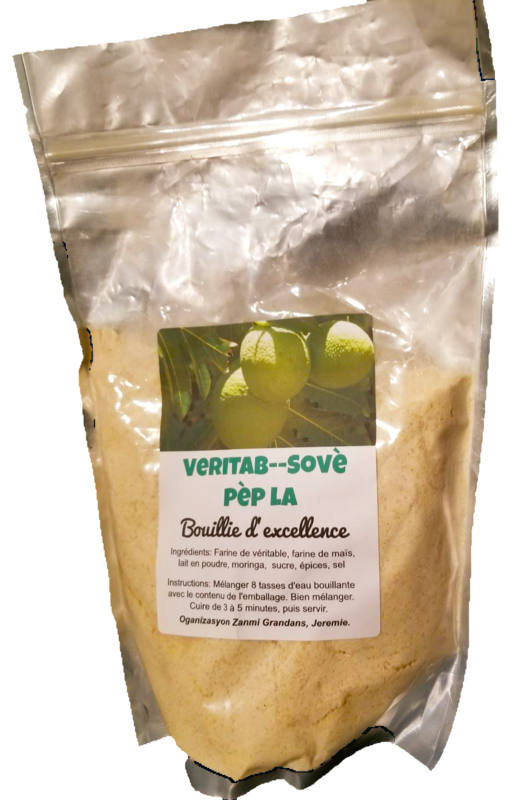 The first product is Bouillie d’Excellence–a breakfast porridge made from corn meal, breadfruit flour, moringa, and spices. All are grown and processed locally. The only imported ingredient is milk powder. Our Agriculture Project Director Wisly Jasmin and his wife Farah, have been experimenting with various recipes to develop varieties that are both nutritious and delicious. Initial taste testing resulted in an empty bowl—and a second helping! Even the adults liked it. A 1.5 pound bag of porridge mixed with 12 cups of boiling water will feed 12 primary school children after five minutes, just a little stirring required. Our team is now testing several varieties of the porridge with primary and preschool students in Sassier. Samples of the winners will then be sent to a laboratory to assess the nutritional content and safety of the porridge. Pre-marketing has identified several potential local buyers. The team will also be marketing to the local WFP office and other NGOs that provide food supplies to schools, community kitchens and orphanages. Bouillie d’Excellence (excellent porridge), locally grown and processed, is a winner for everyone—farmers, hungry students, parents and teachers.